VICTORIES FOR THE WHOLE. “A genuine public life begins with the premise that victories for the whole are greater than victories for any of its parts. We understand that we are members of one another; that the social order will be secure for our own life, liberty and pursuit of happiness only if it is secure for others as well." FACSIMILES OF PUBLIC LIFE. Public life has been all but co-opted by fabricated facsimiles in the private realm. Do we not generally prefer private places, secluded activity circles, cloistered fellowships of faith, private education, even highly-controlled shopping areas? So successfully has America fabricated the look and feel of genuine public life that we likely prefer the facsimile to the genuine article. GOD IN THE GLOWING SCREEN. Cartoonist Bill Waterson shows Calvin bowing down to a television set and crying out: "Oh, great altar of passive entertainment, bestow upon me thy discordant images at such speed as to render linear thought impossible!" I am betting that most of us think of "the public life" as what we see flashed before us on TV. And we wonder what the world is coming to. By the way: I keep bringing offerings of chips, cookies, and soft drinks before the altar of TV, but end up eating it myself when nothing happens. WHICH TAKES MORE FAITH? Interesting to me that private life takes no faith; it just takes money and control and a penchant for making everything extremely "safe." It turns us inward and often in on ourselves. It is a treadmill that takes a lot of negative energy. 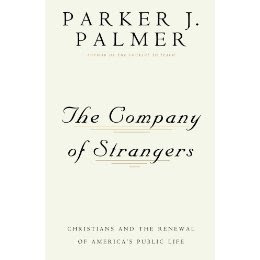 Public life, on the other hand, lives by faith--a faith many have abandoned. It is unpredictable, frequently unruly, ultimately uncontrollable--and utterly life-sustaining. It turns us outward, even inside out. IT KEEPS BREAKING IN. For all our efforts to take things private, the public life keeps breaking out, breaking in, or breaking through our private worlds. Despite our satiation with sameness, neatness, and dullness--and despite being brainwashed regularly by marketing's most sophisticated mind games--we still hunger for a truth-telling solidarity and community and a Kingdom that is beyond our selectively-picked and tightly-controlled private lives and cloistered cells. Turn off the TV, laptop and cell phone for awhile. Sit and chat a while longer at a local restaurant. "Waste" one evening a month at a neighborhood association meeting. Choose nonfranchise, local shops, restaurants, etc. every now and then. Volunteer at a public school. Study the community council and its issues. Participate in a parade, a public rally, town hall meeting, and/or cultural event. Dare to collaborate with people who are "secular." Do something in and for the community that has nothing to do with church. Give of yourself to sustain and build up a community-serving organization. Contribute to making the world real, whole, livable, sustainable, hopeful for others.